It was my first outing at an arts exhibition, only this time it wasn't about paintings but a photography exhibition. The finale of the Lagos Photo Amateur Competition themed – “Lagos under the Prism”. The competition commenced in October 2010 and was organised by the African Arts Foundation to mark Nigeria's 50th independence anniversary, although the finale held in 2011. The exhibition showcased the works of different people telling the story of Lagos from their minds-eye using still photography. My choice for a winner would have been Benjamin Ofoesuwa as the green hue in his piece instantly hit me, and so much that I stopped to read the story. He celebrated the value of education and the drive of Governor Babatunde Fashola (BRF)in building Lagos into a mega city. With a wide grin, I was convinced that his piece was a winning creation. With my inartistic eyes, I would never have chosen the winning piece by Allwell Okpi titled – “Yes, I Live on Water”. For me, without his story, all I saw was the photo of a slum, not the Lagos I want to see. I was biased, so I walked past his piece severally without bothering to take a critical look. But when he was announced as the winner, I became curious and decided to go take an indepth look at his work and read the story behind his artistic creation. Allwell tells the story of the waterside properties in uptown Lagos and those of the poor. While the rich live in houses built out of concrete and marble walls alongside the waterside, the poor live in unpolished wooden houses built on stilts in the water. 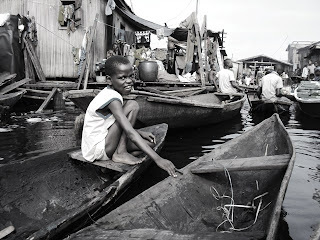 His story is about Makoko, a known slum in Lagos. Allwell says, though on water, people live here, make a living and manage to wear a smile. Allwell's photo, puts Lagos under the prism and it is so true. It is the real Lagos but we shy away from it. His perspective is similar to that of Idowu Alaya whose piece I was endeared to because of my female instincts. Idowu tells the story of a girl no more than four years old feeding a goat in the semi-urban part of Lagos. Their stories are encapsulated by Fela Anikulapo Kuti’s “suffering and smiling” but it’s the Lagos we live in; it is what our cities truly look like after 50 years of independence, mega city or hinter land; it is the Lagos we love, our own New York, the jungle where dreams are made as Alicia says in her Empire State of Mind. The event was an eye opening and gave me a true understanding of the phrase: A picture is worth a thousand words. It is ultimately the story you tell with it. For those of us who work in Lagos Island and environs, ply the third mainland bridge, we catch a glimpse of Makoko daily. Nothing seems to change about it. It is Lagos but seems cut off from Governor BRF’s mega city plan.While we salute the efforts of Governor BRF, there’s still a lot of work to be done.